On the March 18th, a Sheikh, a rabbi, a Member of Parliament (MP) and a reverend gathered at a commemorative service in honour of victims of the Christchurch shooting victims at Jaffari Community Centre (JCC) in Thornhill. More than 250 people attended the service and various faiths were represented. Last Friday, a terrorist and self-declared white supremacist opened fire at Al Noor Mosque and Linwood Islamic Centre in Christchurch, New Zealand killing 50 and wounding 42 others. “This was an attack on humanity,” said Jaffer Jaffer, a Sheikh who works at JCC. “We have to stand up against the hate that exists in our world and unite”. He urged service attendees to be more proactive as a community and to create more opportunities for interaction. “There is far more that unites us then separates us,” he added. Jaffer cited the positive ripple effects of the Peel Interfaith Peace Camp which teaches kids ages 7-11 about the beliefs, traditions and cultures that Muslims, Christians and Jews have in common. The week-long camp is held by a tripartite partnership between a Church, Synagogue and Mosque in Mississauga. Jaffer notes that the relationship between the three communities improved with the introduction of the camp. Deb Schulte, Liberal MP of the King-Vaughan ward, expressed a similar sentiment, “We must squash all extremist points of view and confront intolerance and hatred in all of its forms.” She urged all leaders in the community to work together. “We need more acceptance, more compassion for people who don’t come from the same ethnic background or who happen to worship in a different manner. This is our collective problem, every single one of us needs to be a part of the solution,” she said. She commended the JCC staff for being a model for others to follow due to its many outreach programs like Out of the Cold, Interfaith Outreach, and Open Doors. In light of the acts of violent extremism, the JCC tightened its security measures at it’s mosque. The atmosphere at the mosque was a somber one. “I find it hard to understand how human beings can be capable of such evil,” said Tahera Kassamali, Religious Advisor for Women at the JCC. “There is so much negative coverage of Islam in the media. We need to find avenues of showing people the normal and fun side of Muslims. Let them know what our religion is about, what goes on in our Mosques, and how we are believers of a faith based on serving God and humanity,” she added. Several attendees expressed disbelief and sadness when discussing the New Zealand attacks. 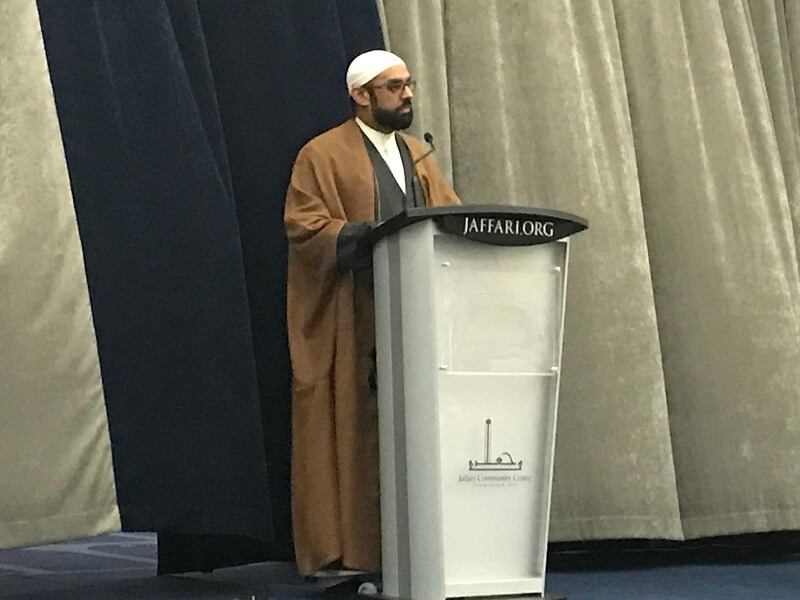 Shafiq Ebrahim, Vice President of JCC stated, “We should all feel safe in our houses of worship no matter where we are in the world.” Mohamed Iqubal Somani, who lived in New Zealand for 42 years before moving to Toronto, likewise was shocked by the atrocities. A regular Friday prayer attendee, he is not deterred from continuing with his regular prayers by the attack. “We cannot fear the unknown and stay at home,” he proclaimed. Reverend Robert T. Royal of St. Andrew’s Presbyterian Church in Maple expressed heartfelt sympathy and condemned the terrorist attack in New Zealand and the dangerous ideologies that motivated it. “If we don’t face white supremacy, it will destroy all of us,” said Rabbi Cory Weiss of Temple Har Zion Synagogue. Rabbi Weiss expressed the Jewish community’s support of those affected by the attack. “We stand in solidarity with you. You do not grieve alone. We are with you,” he stated. He also commended the Muslim community for standing in solidarity with Jews during their time of grief. Schulte said that people must combat ignorance with education and understanding. She also called on people to start speaking up against inflammatory articles and racist taunts in person and online. Statistics Canada reported an increase in hate crimes targeting all categories of religion, with those targeting the Muslim population reporting the greatest rise. In 2017, hate crimes motivated by religion accounted for 41% of all hate crimes in Canada. In the wake of every tragedy there comes a silver lining which proves that good can triumph over evil. This was evidenced by the outpour of flowers outside of mosques, donations made to the victims’ families and children making meals for those affected. Schulte was inspired by the support shown by people around the world, “Love is indeed a stronger force and is embodied by most of the people living on this planet,” she added. Jaffer quoted verses 5-6 from Surah Inshirah in the Holy Quran, “Indeed ease accompanies distress”. He explained that the ease that had emerged from this event could be seen in the outcry of support, compassion and love from humanity. He mentioned that this was an example of the ease that God has promised because it brings about a unity that God wants from us. Sukaina Jaffer holds a Master’s degree in International Journalism. As a freelance journalist, she has written for New Canadian Media, The Guardian, Guardian Unlimited and The Independent. Previous Previous post: How Diverse Are Brampton Newsrooms?